Russian President Vladimir Putin during his meeting with Syrian President Bashar al-Assad at the Kremlin in Moscow, Oct. 20. 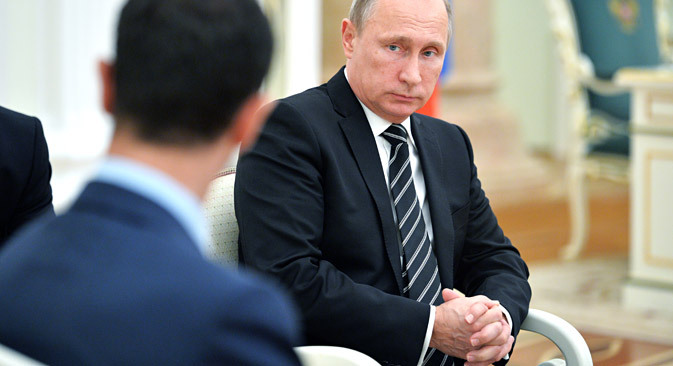 The unannounced visit of Syrian President Bashar al-Assad to Moscow has taken the United States and its allies by surprise, writes business daily Kommersant. Washington's reaction to the talks, as expected, was negative. "We view the red carpet welcome for Assad, who has used chemical weapons against his own people, as at odds with the stated goal by the Russians for a political transition in Syria," said a statement from the White House. According to Dmitry Polikanov, a member of the Center for Policy Studies in Russia Council, the meeting in the Kremlin is a "reminder that a Syrian settlement cannot be reached without Russia and Bashar al-Assad." According to former deputy foreign minister Andrei Fyodorov, the talks in the Kremlin are "a very serious gesture toward Iran, which until recently seriously feared that at some point Russia would give up al-Assad in bargaining with the West." Whether this unexpected step will reap dividends for the Kremlin will become clear at the meeting of heads of diplomatic missions from the Russian Federation, the United States, Saudi Arabia and Turkey, to be held in Vienna on Oct. 23. Is U.S. preparing to open air base in Turkmenistan? Turkmenistan is losing the status of a neutral state and may host a U.S. military base, reports news website Svobodnaya Pressa. Ashgabat has set in motion plans for the Turkmenistan-Afghanistan-Pakistan-India gas pipeline. Its resource base will be the Galkynysh gas field, to be developed by Japan and China. Security assurances are supposed to be provided by the U.S., writes the publication. The project has been repeatedly postponed due to the unstable situation in neighboring Afghanistan. But recently Washington was visited by a delegation headed by Foreign Minister Rashid Meredov to discuss security issues. Fighting has been going on along the Turkmen-Afghan border for several months; the border service has suffered losses, while the threat of incursion by fighters of the Islamic State (ISIS) radical militant group into the country is growing. But could a U.S. military base actually appear in Turkmenistan? According to the newspaper, the case in point is the former Soviet airfield Mary-2, which was used as a base for bomber aircraft during the war in Afghanistan. "To give the base to the U.S. means to automatically receive a lot of trouble and symmetrical responses from the Russian side," said Andrei Grozin, head of the Department of Central Asia and Kazakhstan at the Institute of CIS countries. "I do not think that Turkmenistan is ready to review its relations with Russia. In addition to geopolitics, there is geo-economics. The main source of hard currency for Turkmenistan's budget is China, where the salvo [of missile strikes against targets in Syria – RBTH] from the Caspian Sea, by the way, was accepted without serious irritation. But the appearance of the Americans in Mary will definitely cause a negative reaction on the part of Beijing." Moscow State University has refuted allegations by the scientific journal Nature that the employees of the university were ordered from October to authorize their publications with the censors from Russia’s security service, the FSB, the online newspaper Vzglyad reports. According to the magazine, the new rules were featured, for example, in the minutes of the meeting, which took place at the Research Institute of Physico-Chemical Biology at Moscow State University on Oct. 5. "The meeting in question was conducted on a number of issues of raising the level of published articles, their quality, and citation index," said Andrei Fedyanin, the vice-rector of the Moscow State University. According to him, "no new rules have been introduced,” and the "publication of articles is being carried out within the established standards." The president of the Russian Academy of Sciences, Vladimir Fortov, described the report as a "kind of misunderstanding." "In reality, in all countries, including the United States, before any scientific work is published, it must pass an expert commission. Every scientific organization has an expert council. Usually, small – five or six people. They look at the work and say: Yes, it can be published, it does not contain any undisclosed information. But this is a standard practice that has always existed," Fortov told Vzglyad.